Pullela Gopichand is no less than a legend in the sport of Badminton. As good of a player he was, Gopichand's legacy will surely go down in history as one of the greatest coaches in the history of the sport. Almost single-handedly, the ace former shuttler has transformed the sport of Badminton in India, and it currently sees both men's and women's players among the top 3 in the BWF rankings. Almost the entire current crop of badminton stars in the country come from the famed Gopichand Academy, trained by the legend himself, and it is easy to see why the success rate in the sport is so incredibly high. And now, it seems that the next generation of Gopichand is ready to mix it up with badminton's best. 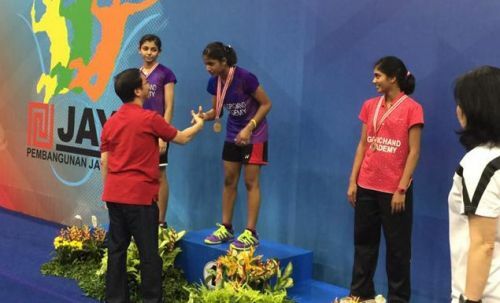 Pullela Gopichand's 14-year-old daughter Gayatri Gopichand has done what many eventually expected, as she has clinched her maiden All-India Junior Ranking Badminton Tournament, which is an U19 singles event. She got the victory over stiff competition from a talented bunch of young and upcoming shuttlers. Gayatri's mother, PVV Lakshmi, won the same crown back in the day, and now sees her daughter emulate her. Gayatri represented Telangana as her state in the event and faced Purva Barve of Maharashtra in the final. The final itself was a high-octane battle, but Gayatri looked in control from the offset and ended up winning the match as well as the championship 23-21, 21-18. What makes the victory even more special is the fact that Gayatri wasn't considered one of the top players when she made her way into the tournament, not even being among the top 16 seeded entries in the U19 girl's category. Purva Barve, her finals opponent, however, was the top seed, and was widely tipped to win the entire tournament. Gayatri's win, on paper, may seem to have been written in the stars, but it was far from the case when she first took to the courts to battle it out against the rest of the pack. On her way to the championship crown, Gayatri beat the likes of Ananya Goel, Kanika Kanwal, Malvika Bansod, Ashwini Bhat K and finally Purva Barve. Her triumph in the U19 category has put Gayatri Gopichand well and truly on the map, as well as, on the path to hopefully replicating her father's phenomenal achievements in the sport.